There’s nowhere better to own a Florida vacation home than at one of the premier vacation resorts on the Palm Coast beaches. Hammock Beach Resort is nestled 30 miles between two exciting cities, St. Augustine and Daytona Beach. Many families who visit the luxury Florida beach resorts often decide to purchase a vacation home at the resort for it’s amenities and benefits. 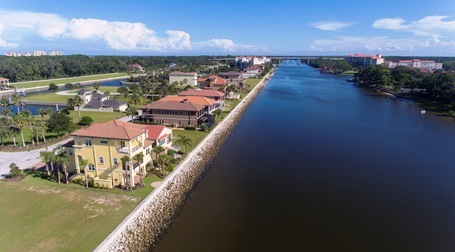 Palm Coast is one of the top Florida retirement cities because of the affordability. The Hammock Beach Resort has a myriad of activities to captivate every family member. We observed kids and adults enjoying the fun and excitement of the Fantasy Pool Complex with it’s twisting water slide, flume, and lazy river. Parents were scheduling spa treatments, taking classes at the fitness center, or playing on one of the two award winning golf courses: The Conservatory, known for undulating greens uncommon in Florida, designed by Tom Watson or The Ocean course, designed by Jack Nicklaus, with six holes overlooking the ultimate water hazard - the picturesque Palm Coast FL beaches.